We NEED the ocean to breathe, it's really that simple! In fact, marine plants give us terra-firma dwellers 70 per cent of the oxygen we need to live. And, even though we know this, we are still polluting the atmosphere so much that the temperature and chemistry of the oceans are changing. "Our oceans are an unsafe place to live." When I first read this quote on World Animal Protection's website I was very perplexed. How can this be? How can the oceans be an unsafe place to live? Well, after a little more fishing, I found the answer is even worse. I'll come back to this point later. The ocean is big, it's beautiful and it's the heart of our planet. It regulates the earth's climate, feeds hundreds of millions of people, is home to an abundance of wildlife and even gives us medicines to live longer, healthier lives. But probably the most important factor is that the ocean gives us the oxygen we need to breathe through the miracle of photosynthesis. We NEED the ocean to breathe, it's really that simple! In fact, marine plants give us terra-firma dwellers 70 per cent of the oxygen we need to live. And, even though we know this, we are still polluting the atmosphere so much that the temperature and chemistry of the oceans are changing. We see this change most noticeably in Australia's Great Barrier Reef where fish are deprived of oxygen and plankton are having a really tough time making their shells. All of this leads to the mass bleaching of coral reefs in the area. The situation is actually very dire, because along with what we are doing to the chemistry of the ocean, we are also making it a very unsafe place for marine life to live thanks to something called ghost gear. 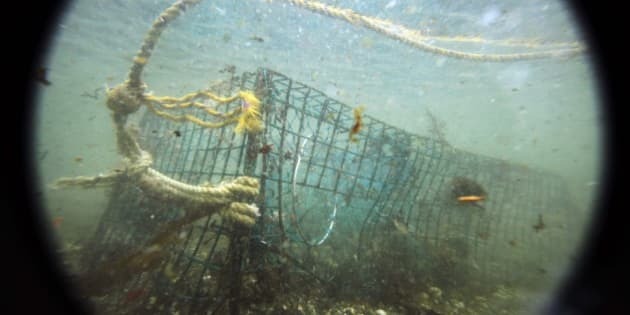 Ghost gear is discarded, lost and abandoned fishing gear that makes the ocean a death trap for marine animals and it's why World Animal Protection has launched the Sea Change campaign. We've all seen those heart breaking news stories about whales that become entangled and the courageous rescues that happen to try and save them. This is only a fraction of the impact ghost gear has on animals. This gear, which was designed to catch and kill animals, represents one of the biggest threats to sea life, accounts for about 10 per cent of the plastic garbage in the water and is found in every ocean and sea on the planet. It's a major problem that most people know very little about. "The United Nations Environment Programme (UNEP) and the Food and Agriculture Organization of the United Nations (FAO) conservatively estimate that some 640,000 tonnes of fishing gear are left in our oceans each year. In just one deep water fishery in the north-east Atlantic some 25,000 nets, totalling around 1,250 km in length, were recorded lost or discarded annually." This length of 1,250km is the distance from Toronto to Washington D.C.! Each net is a floating death trap. When 870 ghost nets were recovered off Washington State in the U.S., they contained more than 32,000 marine animals, including more than 500 birds and mammals. World Animal Protection estimates that "entanglement in ghost gear kills at least 136,000 seals, sea lions and large whales every year. An incalculable number of birds, turtles, fish and other species are also injured and killed." These are very alarming numbers! They are also the main reason why we need to change the way we look at the ocean. Groups like World Animal Protection are partnering with other NGOs and through the Global Ghost Gear Initiative or GGGI and the Sea Change Campaign, they hope to save more than one million animals by 2018. Ghost gear is rapidly becoming a global concern! There are also amazing people doing amazing work. Joel Baziuk, Operations Supervisor at Steveston Harbour Authority in British Columbia, is one of them. Joel along with other marine partners is helping to turn old nylon nets into carpet tiles and other consumer products. "Although recycling for its own sake is a noble initiative, what really motivates me to grow this program is our ability to help prevent ghost gear from entering the environment and causing such enormous harm to marine animals -- in my eyes, this is what really makes this project special," he said. Joel is looking for ways to expand the program to as many other harbours as possible. Local fishers benefit as well, as they can recycle their nets at no cost to them, as opposed to paying landfill disposal fees. Some are also employed in the off season, prepping nets for transport. About 40,000 pounds of nylon netting is needed for each load. Joel is also exploring ways to recycle other types of fishing gear as well. "I just want to make things better than they were when I found them." On the other side of our beautiful country, the Fundy North Fishman's Association (FNFA) in St. Andrews, New Brunswick, has been working with local fishers to remove ghost gear and derelict lobster traps and with local industries to develop prevention strategies to minimize gear loss. The plastic used to make these fishing nets have long-lasting dangers, it's durable and can remain in the ocean for 600 years, and plastic does not biodegrade, it photodegrades, taking hundreds of years to breakdown into tiny little pieces that will bring even more issues to an already endangered ecosystem. The nets and other gear are also resistant to biting and chewing, so when an animal gets entangled, it has no way of surviving or getting free. If you think this does not affect you, you are wrong. The SeaDoc Society have estimated that a single ghost net can kill almost $20,000 (USD) worth of Dungeness crab over 10 years. On top of that governments and marine industries spend millions of dollars annually to clean and repair the damage caused by these nets. Humans, namely divers also face grave danger when navigating the seas. There is hope, but we all have to do our part. The GGGI will unite people and organizations that can facilitate and drive real change. Working collaboratively with NGOs, the fishing industry, governments and others, the GGGI aims to ensure safer, cleaner oceans by driving economically viable and sustainable solutions to the problem of ghost fishing gear globally. Josey Kitson of World Animal Protection says, "We can highlight the problem, we can show pictures with seals being caught in nets or with rope around their necks, but solutions are what's most important." Kitson would like to see comprehensive recycling systems in place for end-of-life fishing gear at many more ports; local solutions that make sense for each region of the world; major retailers reflecting the issue in their CSR and purchasing policies; and committed governments and industry.